Preheat the oven to 190°C/gas mark 5. Place all the vegetables and about half the herbs and 2 tablespoons of the oil in a deep-sided roasting pan or casserole. Mix the vegetables with your hands so the oil and seasoning is well distributed. 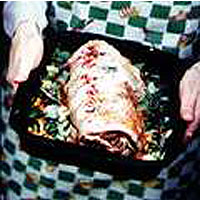 Place the lamb on top, rub with remaining chopped herbs, salt, pepper and oil, and put in the oven. After half an hour, add the wine, stock or water and lentils and return to the oven. Check after 45 minutes to see if the lentils are cooked al dente - this may take up to 1 hour. The lamb will render away quite a lot of fat, which you can skim off if you want to. Carve the lamb and serve, arranged over the lentils with some chopped parsley.